Marcos and Malcolm Allen are big shots, and they deserve every accolade they get. The two boys are now 18-years old and headed to college. That might be something to be proud of were it not for the fact that they’ve accomplished so much more. Both of the young men have been chosen as valedictorians for their high school, graduating with a 4.8 grade point average. This fall, they head to Stanford University, both with basketball scholarships. It’s hard enough to be a division-I basketball player. But to be valedictorian on top of that, along with your twin brother, well, that’s the kind of feat that may not be accomplished for another 50 years. “It’s been a very long road, academically and athletically,” Marcos told Action News. The twins graduated from Del Sol High School and are motivated to remind others of the importance of hard work and determination when it comes to achieving your goals. Their mother, Trina Wiggins, graduated from Stanford University herself. She says that if you want to be successful, you have to plan for it. “You have to have a plan.You can’t just go day to day and think this is going to miraculously happen,” she said. The twins put their plan for achievement together in the seventh grade and stuck with it. They both started preparing for the SAT in middle school. Now, they are preparing to reap lifetime benefits from their hard work and strong parenting they received from their mom. “It all pays off and I feel like the earlier you start, the better you’ll end up,” said Malcolm. Dr. Boyce Watkins, author of the book, “Everything You Ever Wanted to Know about College,” says that the story of the twins illustrates the important role of good parenting. Dr. Watkins also says that the twins illustrate that being athletically gifted is not any different from being academically gifted. After playing basketball for Stanford and finishing college, the two young men hope to one day play for the Los Angeles Lakers. By the age of 7, Loiseau spoke French, Creole, Spanish, Mandarin, Arabic and Russian. She also plays the harp, clarinet, violin, drums, guitar and piano. Andrew is a master violinist based out of Atlanta. He was named Concertmaster of the Georgia Music Association’s All-State Middle School Orchestra. The title goes to the most skilled musician in the section. Raised by a single father, Autum was ridiculed by highly regarded conservatives at the age of 7 for writing a poem that highlighted the travesty of slavery. Autum never wavered and mastered languages such as Arabic, Swahili and Spanish. She scored 149 on the standard IQ test. At age 13, she was accepted into the University of Connecticut. The Imafidon family is known as the smartest family in the U.K. The youngest siblings, Peter and Paula, made history by becoming the youngest students to enroll at secondary school. Their older sister, Anne-Marie, was the youngest student to pass A-level computing at the age of 13. At 17, Rochelle Ballantyne is one of the top chess players in the world. She is currently on the verge of becoming the first black American female to earn the title of chess master. Ginger Howard is the youngest black American woman to become a pro golfer. Howard is competing to become the fifth black American woman to join the LPGA Tour. Tony used failure as inspiration. After he didn’t place in the eighth grade science fair, Tony interned at Shands Hospital and developed a method of reducing the amount of time it takes to perform hysterectomies and potentially reducing the risk of complications after the procedure. He was honored for his contributions. Chelsea has been an accomplished pianist since the age of 5. Now 13, Chelsea has performed at Madison Square Garden, The Metropolitan Museum of Art, and Steinway Hall. She’s also an artist and straight A student. Daquan created a walkie-talkie, bulletproof helmet at the age of 12. He’s currently working with Johns Hopkins University to gather funding to patent the idea. Homeless teen Chelsea Pearce is the type of girl who’s tragic, yet triumphant life is the thing tear-jerking movies are made of. Spending most of her teen years living in her mother’s car, Chelsea has managed to do the damn near impossible–graduate from high school…at the top of her class. That’s not all! The impressive Charles Drew High School senior will be going to college at Spelman College, where she will bypass freshman and sophomore year to start as a junior! Fearce spent her last two high school years taking college courses and her 1900 SAT score made her an academic star at her school. Reenita may be facing poverty head on, but her children are over-achievers! 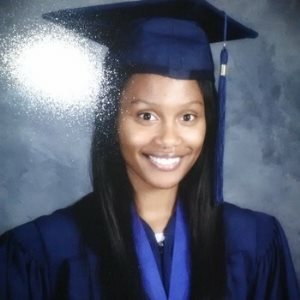 Pearce’s sister is graduating from George Washington Carver High School as salutatorian. Shepherd attributes their academic achievements to the amount of reading she would do for them growing up. American student Gabrielle Turnquest was called to the Bar of England and Wales after passing her exams at just 18. The average lawyer undertakes the Bar Professional Training Course when they are 27. However, the young high-flyer will not go on to work in the UK as she wants to return to her native America to qualify as a lawyer there. But her success means she is also called to the Bahamas Bar, the country of her parents, and she hopes to work there. Gabrielle took the course, at the University of Law, along with her sister Kandi, who also passed her exams but at the ripe old age of 22. The teenager, who is originally from Windermere, Florida, hopes eventually to be a fashion law specialist. She said: “I am honoured to be the youngest person to pass the Bar exams but, really, I was not aware at the time what the average age was. Gabrielle has already made history at her previous university, Liberty University in Virginia, where she was the youngest person to finish an undergraduate degree there, in psychology, at the age of 16. If the youngster wanted to work as a barrister in the UK she would still have to carry out a pupillage at a chambers for at least a year and then be granted a tenancy. Traditionally, a trainee lawyer had to be 21 to be eligible for the call to The Bar but that was scrapped in 2009 with the introduction of the Bar Training Regulations. Children are told they should walk before they can run but an eight-year-old from Tottenham could read before he could do either. Joshua Beckford, of Portland Road, could understand the alphabet and point to different colours on a chart when he was ten months old. 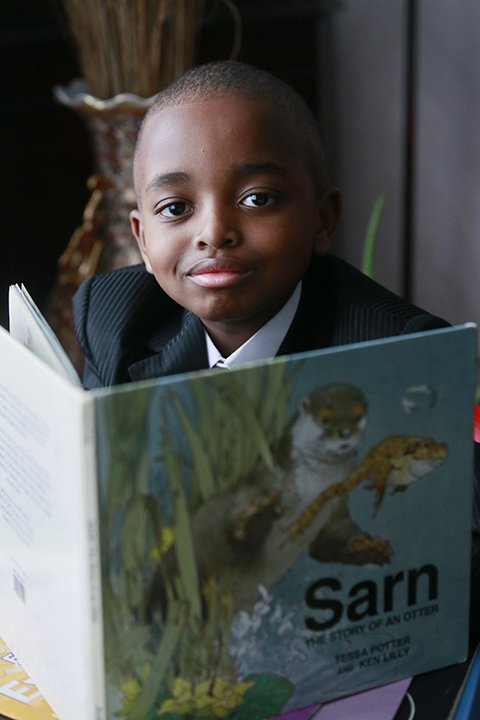 At six he started taking classes at the University of Oxford and now dreams of becoming a neurosurgeon. His father Knox Daniel said he first noticed his son was clever when he was sitting on his lap while on the computer. He said: “I started telling him what the letters on the keyboard were and I realised that he was remembering and could understand. Joshua learned to read fluently by the time he was two and a half and taught himself to touch-type on a computer before he could write using a pencil. He can speak Japanese, practices medical surgery on a computer simulator and has completed more than 1,000 maths problems. In 2011 Mr Daniel wanted to challenge Joshua so he wrote to the university to see if it would let him participate in a philosophy course for bright children between the age of eight and 13. They agreed and Joshua was the youngest student ever accepted and passed with a distinction. 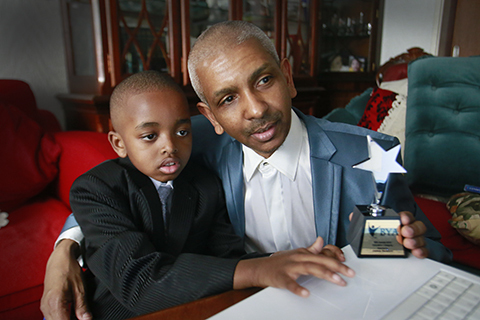 Mr Daniel said he no longer notices that his son is different and just seems like a normal eight-year-old. He said: “It can be a bit of challenge because sometimes he asks so many questions. “The other day he asked me “Is infinity an odd or an even number?” and obviously I had no idea. The eight-year-old was recently diagnosed with high functioning autism which means that along with other symptoms of the condition he is also very intelligent. His father said: “Because he is autistic he can be a bit difficult sometimes. “He doesn’t like loud noises and always walks on tip toes and he always eats from the same plate, using the same cutlery, and drinks from the same cup. Mr Daniel has joined support groups for people with autistic children.